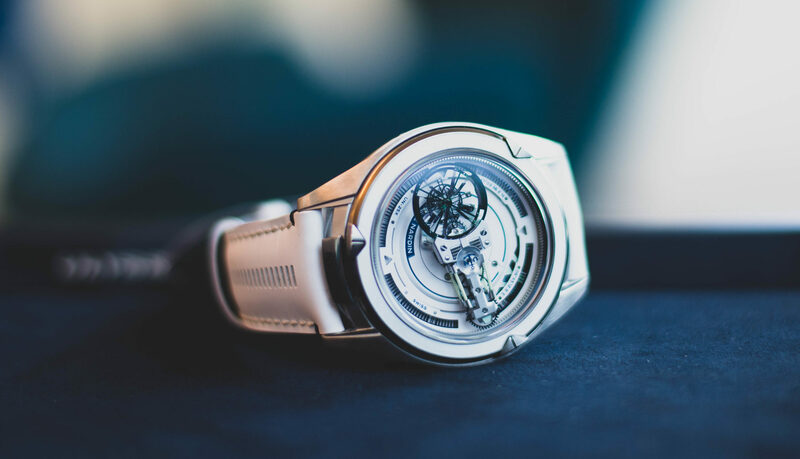 Bell & Ross has been passionate about aviation ever since its very beginnings, when a team of designers and aircraft control specialists began working on watches specifically made to equip professionals in the aeronautical industry. Bell & Ross’s watches were crafted in the most resistant materials and featured simple dials inspired by an airplane’s panel design, with big numerals, hands and indexes increasing the readability of time. These watches met the demanding needs of professionals operating in extreme conditions—such as pilots, bomb-disposal experts and astronauts, whose missions all depended on precision and perfect timing. Although two decades have passed since the launch of the brand, Bell & Ross continues to nurture its passion for aviation through a variety of aeronautical timekeeping instruments and watches, such as the newly released BR 03-94 Carbon Orange. Every single inch of this limited edition pilot chronograph increases the readability of time, whether through the design of the case and dial or through the choice of strong colors. The BR 03-94 Carbon Orange reinterprets the brand’s iconic airplane-panel design in a mix of orange, white and black—three colors that are commonly found in cockpits. While matte black is used onboard airplanes for its anti-reflective properties and white for its legibility, orange is the color of choice to highlight important information. The integration of these three colors on the matte black dial not only increases the legibility of this timepiece, but also contributes to an eye-catching yet simple design. The enlarged white numerals, indexes and hands are coated with a luminescent substance to ensure proper reading in all circumstances, whether flying quietly across the Atlantic Ocean or through a bad storm. 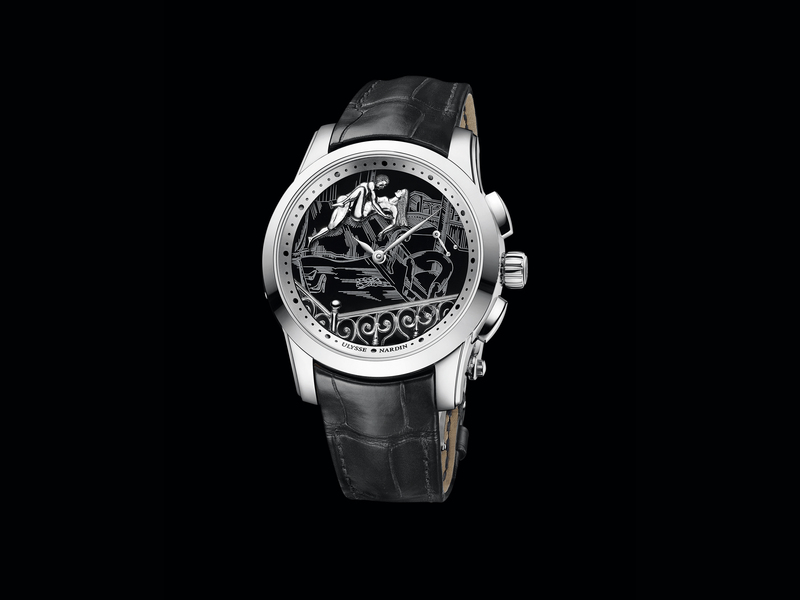 The two chronograph counters at three and nine o’ clock, as well as a small date window between four and five o’ clock, are featured in white. Standing out in contrast with the monochrome design are the hands of the seconds and the 30-minute chronograph counter, which are represented in orange and bring a pop of color to the timepiece. The 42mm square case is crafted out of black PVD steel finish, while an orange tappet located on the right-hand side of the case is made out of steel with a polycarbonate-ABS protective cover. Powered by an ETA 2894 automatic movement and limited to 500 pieces, the BR 03-94 Carbon Orange comes with a choice of two straps—black rubber or orange canvas. 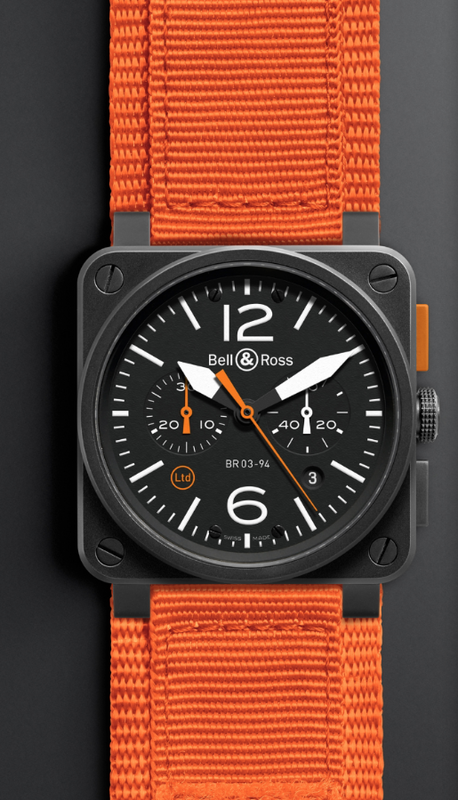 With a touch of orange and Bell & Ross’s iconic square design, the BR 03-94 Carbon Orange is the perfect co-pilot to bring along on all sorts of adventures—whether in the skies or on land.